The refrigerator is full of delicious organic vegetables from this last weeks D2D delivery and it is about time they get put to use. 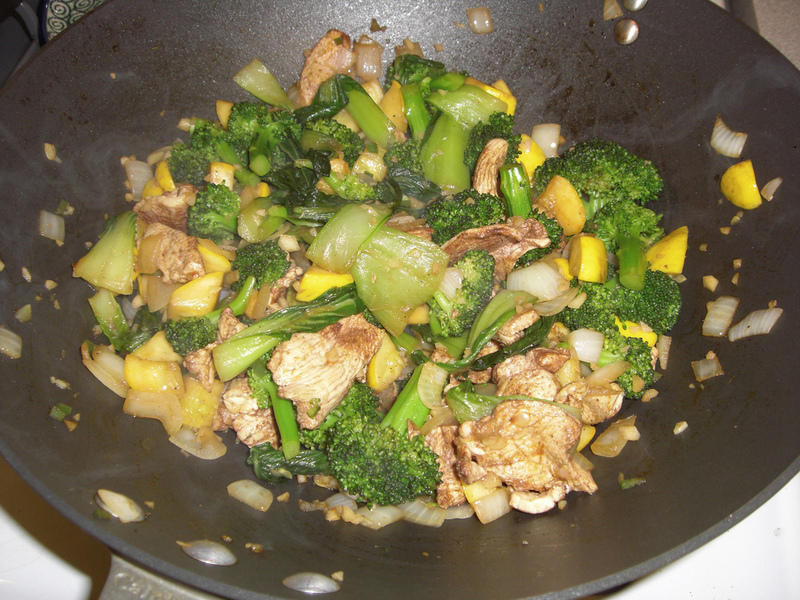 I decided to throw together a stir-fry featuring the baby bok choy and broccoli. Whenever I make stir-fry it is always just thrown together with ingredients on hand. For this dish, I will write out what I used and how I cooked it. Spread the 5-spice over the thinly sliced chicken and toss with your hands to evenly spread. 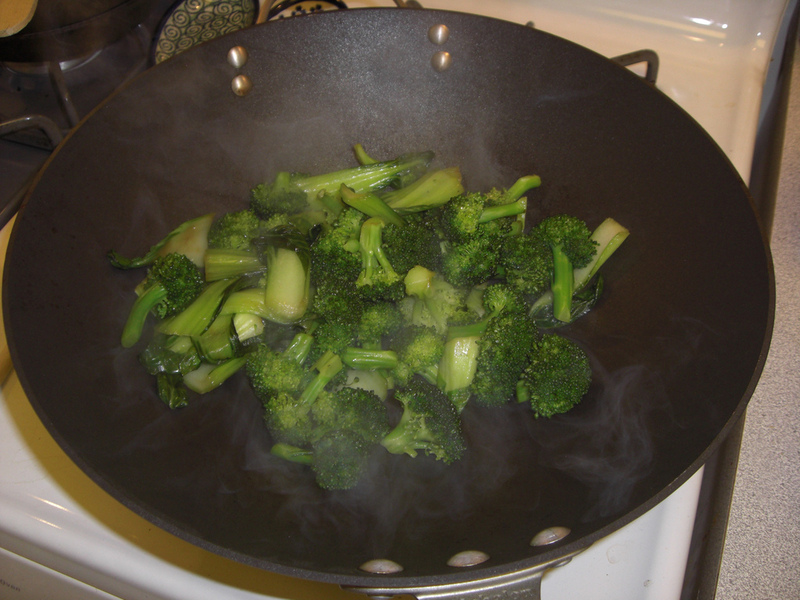 Heat Wok on HIGH until water droplet vaporizes when dropped in the middle of the pan. Add 1/2 TBSP peanut oil (or whatever you like to use), and add thinly sliced chicken. Cook until just starting to brown (about 2 minutes), moving constantly. Remove and keep warm. Add a tablespoon of water to the pan and quickly deglaze, then quickly wipe out to remove any browned bits so you can continue to use the wok for the upcoming steps. Step 2: Prepare the garlic. In a separate small pan, quickly saute the garlic in a small amount of oil until fragrant. Scrape garlic into a bowl and save for later. Heat wok on HIGH until water vaporizes. Add 1 TBSP peanut oil and quickly add onion, squash, and jalapeno/hot pepper. Moving the food constantly, cook until the onion is just opaque, about 4 minutes. Add sauteed garlic and cook for another minute. Remove from heat and place in a bowl. Deglaze pan if needed, or at the very least wipe the wok clean of any debris. Heat wok on HIGH again. Add 1/2 TBSP peanut oil and then add the broccoli and the bok choy, stirring constantly until the bok choy starts to wilt. At this point I added a few tablespoons of water to help steam the veggies, covering for a minute, tossing again, and then covering. Be careful so it doesn’t burn. Once the broccoli just starts to be tender, reduce the heat to medium, add the onion mix, chicken, Sriracha. Stir to blend. Salt and pepper to taste. Serve over rice or noodles. Easy and delicious!